Pizza Dosa| Dosa Pizza is nothing but uttappam topped with sauce, veggies or non vegetarian ingredients with some cheese topping. It is an easy to prepare twist to the Italian pizza. Instead of bread base dosa batter is used. Quick breakfast or snack for the school going kids. I have made the first tricolour pizza for the Independence day to match the flag theme. Other pizzas i made it on the next day with sausage and mushroom and sweetcorn filling. 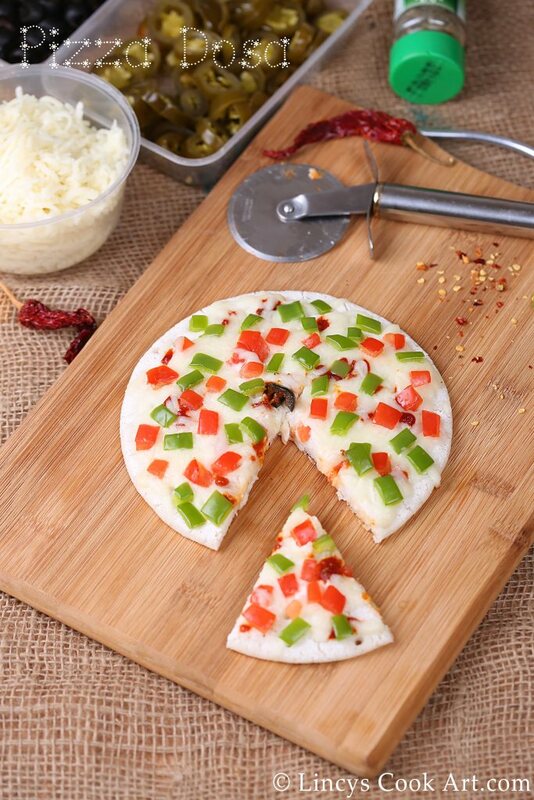 You could add the veggies of your choice to make your pizza more colourful, tasty and attractive. I remember the movie 'Kakka Muttai', in that the granny make pizza with dosa batter for the kids who cant afford a pizza. Creative granny! Heat the dosa pan, once it becomes smoking hot slightly grease the pan and add two big ladle full batter and make the dosa like uttappam. Just spread the dosa at the centre to spread the batter evenly. Donot make concentric circles. Drizzle half a teaspoon of oil at the top and sides. Now the dosa starts to form holes on top. At that time add the pizza sauce or tomato ketchup by drizzling over it randomly. We can not spread the sauce like pizza as the top has not cooked well. Add the sliced veggies or topping of your choice and sprinkle the grated mozzarella cheese and sprinkle the oregano and chilli flakes if you wish. Cover with a lid and allow to cook on low flame till the cheese starts to melt. Remove from pan and cut the dosa pizza and serve hot. 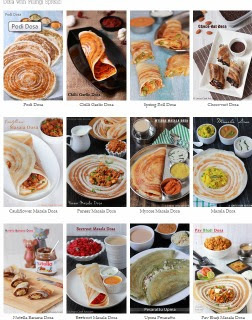 Note: You could transfer the dosa if you have microwave and cook for one minute to easily melt the cheese and cook the veggies. Donot keep the veggies or cheese before the dosa form holes init. The top of the dosa batter mix with vegetables and will not cook at the middle.